Do you need a waterproof device to record power and energy? Now CAS DataLoggers offers the flexible new PEL 105 Power and Energy Data Logger from AEMC. 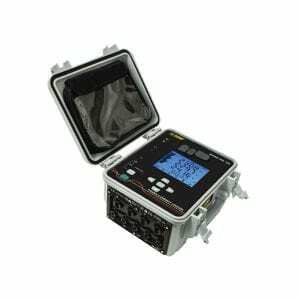 This new data logger is ideal for electricians, engineers and contractors working in building/system monitoring and upgrades, as well as residential energy audits. These cost-effective products have high speed and a removable SD memory to suit your specific application. AEMC PEL loggers offer all the essential functions for logging power/energy data from most electrical power networks in use today. AEMC’s new Model PEL 105 is a simple-to-use Power and Energy data logger that monitors both traditional and renewable energy sources. It monitors and records power, energy, cost and harmonics locally or from anywhere in the world. The PEL 105 is built into a waterproof case with an IP67 rating to withstand the elements. This new product is perfect for system monitoring and upgrades, including compliance to article 220.87 of the NEC, as well as overall energy audits and incoming power monitoring. It also comes available with an Android™ App to configure, view and capture data wirelessly. Bluetooth and Wi-Fi wireless communication provides the operator with the ability to work from a safe distance away from dangerous voltages and currents without the need to wear PPE gear. AEMC’s new PEL 105 data logger measures volts, amps, watts, VARs, kWh, power factor and harmonics out to the 50th order. With 5 voltage and 4 current measurement inputs, the data logger is ideal for tracking energy costs including time of use. The PEL 105 is pole-mountable and can be configured directly from the front panel, through the DataView® control panel, or the free Android App. With only minimal programming required, users can select specific storage rates and demand intervals to suit their application. Powered from phase inputs up to 1000VAC or from a wall receptacle, the PEL 105 is rated 1000V CAT IV and also satisfies NEC 220.87 recommendations. All connected current sensors are automatically recognized. Energy costs can be quickly calculated and displayed just by specifying the unit cost for a kilowatt hour. Data can also be retrieved using USB, Bluetooth and/or Ethernet (local or internet). AEMC Power and Energy Data Loggers are ideal for electricians, engineers and contractors working in building/system monitoring and upgrades. These cost-effective products are also popular for recording and presenting data for residential energy audits. The data logger includes DataView® software for data storage, real-time display, analysis and report generation (with supplied pre-defined or custom templates). AEMC’s new Power & Energy Logger app enables you to work with your AEMC Power & Energy Logger Models 102, 103, and 105 instruments from an Android device. These instruments provide all the necessary functions for power and energy data logging for most 50Hz, 60Hz, 400Hz, and DC electrical distribution systems. The app also allows you to easily connect to PEL instruments that may be placed in hard-to-access locations.